As mentioned on my post about ‘Home restaurants’ or supperclubs as they are known in the States, I am finally starting my own paladare ‘The Underground Restaurant’. Opening night 7th February. Location: Kilburn. Price: £10 menu fixe. Drinks can be bought or bring your own. Food: vegetarian, cooked on an Aga. Email me at marmitelover@mac.com to book a place/table. Further nights/themes to be announced. There does seem to be a buzz about this…article in the Guardian. Previous Post: « Food to spoil father with, like a child. I have bookmarked your page. Will check on dates and might drop in! Cool, look forward to your visit from Switzerland! Can I join in the fun too? I’m in Queen’s park, so im just around the corner! If you came Lennie, I’d probably have you in the kitchen with me! This sounds awesome. I’ve wanted to organise one of these for years. Have you heard of Ghetto Gourmet? Like the title of that piece …anti-restaurants…very punk. Many thanks for having me over here! Glad you liked the article. I’ve just checked the date and I can’t make it to the 7th… might you host other Paladare evenings? Browners…I will be doing it every Sat night! Will soon be featured in the Guardian. Hope to see you soon. First night was last night and it went just great. You could be a guest chef chez moi? Fantastic! Can I come to the next one? Pretty please? What a great idea! Will have to come and visit one Sat eve…Heard about you via Bellaphon’s review. 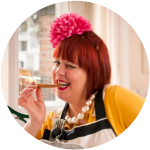 Yes email me at marmitelover@mac.com and I’ll give you details.